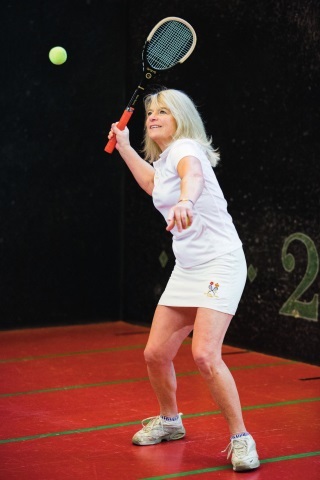 Lesley started playing real tennis whilst working as a squash and lawn tennis professional at Oxford. As there were no professional championships for ladies, Lesley was forced to give free lessons and marking for 18 years. This enabled her to retain her amateur status and compete in amateur tournaments. A superbly talented player, who in latter years has been hindered by having replacement hips (4) and has now had to retire from playing tennis although she still marks and gives occasional lessons. Golf is now her main source of competition. Lesley runs Events 2000 Unlimited which co-ordinates the National League and organises corporate events involving real tennis. She introduced M&G, Singer & Friedlander and Maurice Lacroix to the International Real Rennis Professionals Association. Lesley has also contributed greatly to Ladies tennis in this country and in particular was the founder chair of the Ladies Association from 1981 until 1991.